"Can I leave a zero-star review?" For several years after I wrote my novels, I received mostly positive feedback about them. Even discounting encouragement from family and friends, the few reviews or emails I got were uniformly positive. Now that I’ve sold a few thousand copies to complete strangers, I’ve been forcefully reminded that not everyone will like my novels. It makes me feel only marginally better to remind myself that not everyone will like any novel–just take a look at some classics and bestsellers on Amazon and all their 1-star reviews. But getting bad reviews still stings. Now, when I say bad reviews, I don’t mean balanced or somewhat critical 3- or even 2-star reviews. I’m talking about 1-star reviews filled with pure vitriol, slamming every aspect of the book and not mentioning a single redeeming quality. Reviews that question my regard for literature, hate the main character like he killed their dog, call it cliche, boring, predictable, terribly written, the whole thing. Reviews that say “DO NOT BUY” in all caps. Or a review, from a reviewer who only leaves 1- and 2-star reviews, saying he liked the first novel (but couldn’t be bothered to write a positive review), but then found the time to come and slam the sequel with a 1-star review. First of all, I wonder what kind of a person has that much hatred, who wakes up in the morning and says, “Let’s try to hurt the sales and smash the dreams of an aspiring indie author.” Do they realize there’s an actual person on the other end of the computer screen? One who takes his writing very seriously? Or is that the point? 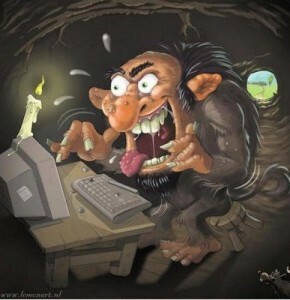 Is it simply “trolling” at its worst, designed just to elicit a response for the poster’s own amusement? The problem is that, to maintain a respectable 4-star average (on a scale of 1 to 5), a single 1-star review counteracts three 5-star reviews. Even worse, a single 1-star review would require twelve honest, solid, 4-star reviews just to inch back above 3.75 (which gets rounded up to display 4 stars). Now, I can understand that some people may not like my book. Some people don’t enjoy sci-fi, or romance, or thrillers, or certain writing styles or types of characters. I thought Harry Potter kinda sucked (although I didn’t go leave a nasty review), but lots of people apparently loved it. And I realize my novels are not perfect or the greatest books ever written; truly, I do. But I’ve read enough books to know that they’re not 1-star novels. That the writing isn’t “terrible.” And that they can’t be all bad. So it makes me wonder about the motivation behind these 100% negative, strongly-worded, personally-attacking, 1-star reviews. So, what can be done? Well, I can’t do much about it. I’m not going to review my own novel, or give a troll just what he wants with an angry response. So, that leaves it up to my readers. So, anyway, if you did enjoy the novel, it would mean a lot to me if you could help out by posting reviews for one or both of them–and it doesn’t cost you a cent. The main place to post is Amazon, but please consider also posting it (you can even copy & paste) at Barnes & Noble, Smashwords, Kobo, and the Apple iBook store. I do very much appreciate it, and it helps me ignore the trolls and the haters, and get back to concentrating on writing.